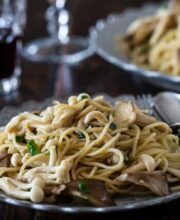 This is a variation of one of the most popular recipes from my cookbook (Todd & Diane posted the recipe for Garlic Butter Noodles) and SteamyKitchen.com (Garlic Scallion Noodles). Anyways, the miso paste, even just just a spoonful of it, melted into butter gives the entire dish richness (without adding meat!) 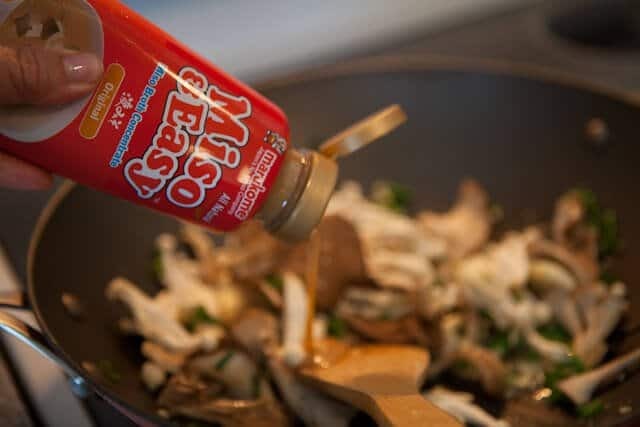 I’ve created this recipe for my client, Miso & Easy, who makes ready-to-use miso paste. 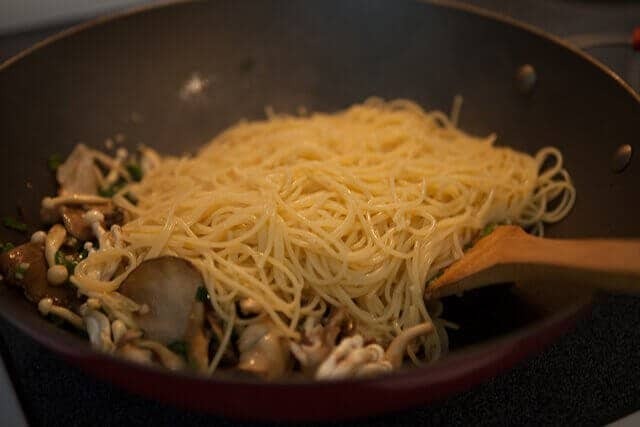 You can use any type of noodles that you want, Asian noodles or even spaghetti noodles (which is what I used). The secret ingredient is miso paste and Maggi Sauce….but soy sauce will work just as well. 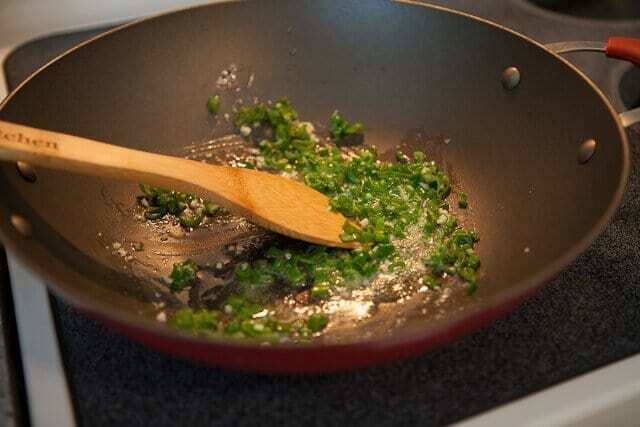 Get your wok out (or a large saute pan with high sides) and add saute the garlic and green onions in butter, but for the love of Buddha, don’t burn the garlic – keep the heat in control! Cooked noodles and toss! toss! toss! 1. Cook the pasta according to package directions. Drain and set aside. 2. Heat a wok or large saute pan over medium heat. When hot, add the butter, garlic and green onion. Cook for 1 minute or until very fragrant, making sure to keep an eye on the heat so that the garlic does not burn. 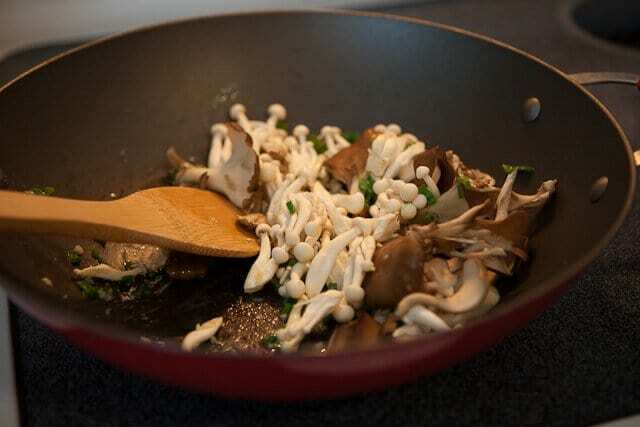 Add in the mushrooms and cook for 2 minutes. Add in the miso, Maggi Sauce (or oyster sauce) and stir. 3. Add in the cooked pasta and toss well. 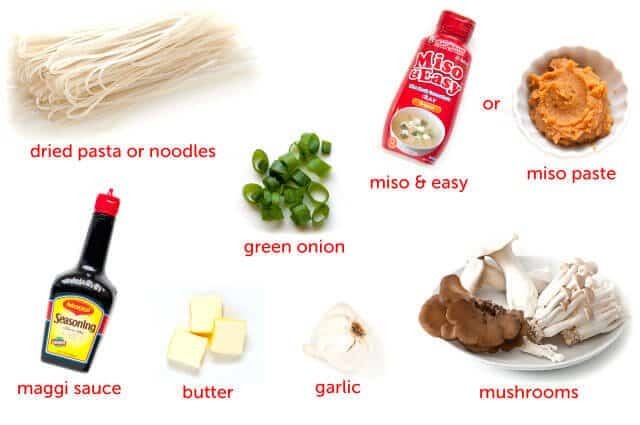 I found this recipe earlier today on a search for “miso pasta”. I am low inventory in my fresh pantry, but I made this and it was just rockstar! So no mushrooms added (I didn’t have any), and I used oyster sauce as per the suggested substitution (thank you for substitutions on your site in general–very helpful!) I added an egg on top. Delicious, quick, and satisfying. The flavors are addictive…Thank you!!! A keeper!!! Garlic spicy! .. loving it! We love this. Relatively easy and very good. Really easy and now a new family favorite! Thanks! My family was hungry and I had just bought some fresh mushrooms (Shiitake, Bunashimeji & Oyster) yesterday. Your recipe was the first to pop up in my “Japanese Mushroom Recipe” search. It is a wonderfully DELICIOUS and easy meal! 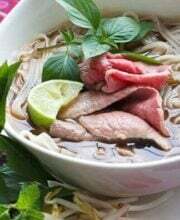 I used some green tea noodles I had been wondering what to use them for, they added just a hint of extra flavor without overpowering this dish. Thank you for sharing! Hi Korena – I noticed the same thing so I looked it up online and found the following on Cook’s Thesaurus. Hope this helps! Looks absolutely amazing. Toss! Toss! Toss some more! Well, I plan to. This is a very good recipe, very quick to prepare. My need for a hot taste give me the right to add a little hot tomato sauce and grated cheese, optional mixed with finely chopped mushrooms. Looking Awesome can’t wait for have this wonderful dish! This recipe sounds awesome. I really need to find Miso Easy! Miso is great for making stirfrys. From my time in Japan I’ve learn a number of classic miso combinations. Mix Miso + Oyster Sauce and a little cooking wine. Then stir fry beef and green and red peppers with ginger and garlic in sesame oil. Finally add the miso combo and fry a little more. This tastes fantastic! And a really simple way to enjoy Miso is with ice cold slices of cucumber. Simple smear it on the cucumber and eat. Really refresing in the summer heat and a classic Japanese dish. I keep coming back and looking at the dish and the recipe. 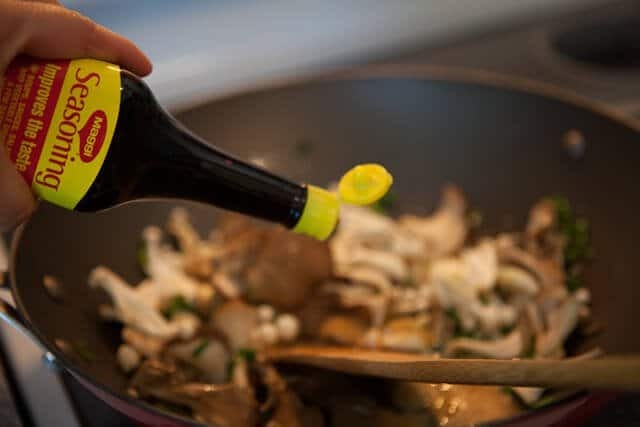 Absolutely nothing can go wrong with any food as long as it has enough garlic in it. My favorite vegetable. 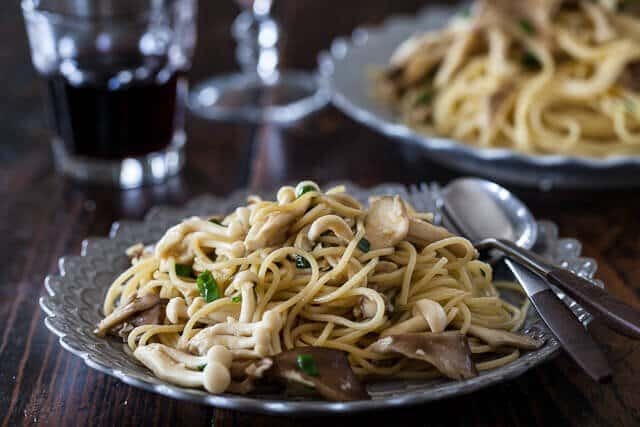 Oh man, garlic anything with mushrooms means I am all on this recipe! I love how you “spiced” it up with the mushrooms. I would have honestly added crab lumps or shrimp into it. 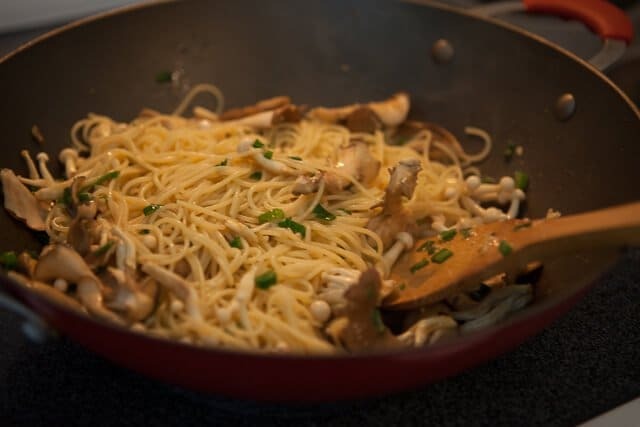 It reminds me of a recipe my older brother showed me of garlic noodles with dungeness crab. Can’t wait to try this! This pasta looks delicious, Jaden! I’ve got to find me some of that Miso & Easy. I’ve been keeping my eyes open, but havent’ seen it in my local market yet. Perhaps I will have to bite the bullet and purchase it on-line. Everything you make with it looks amazing! I just read the latest issue of Bon Appetit and was convinced to buy miso to make miso butter. Now this will be the first thing I make; thank you! So easy & it looks absolutely delicious! This looks so tasty! If I don’t use Maggi, do I substitute soy sauce or oyster sauce? It says soy in the post, but oyster in the recipe. Thanks! The Cyclist just brought me my first tub of miso paste and I’ve been experimenting! This looks really good! 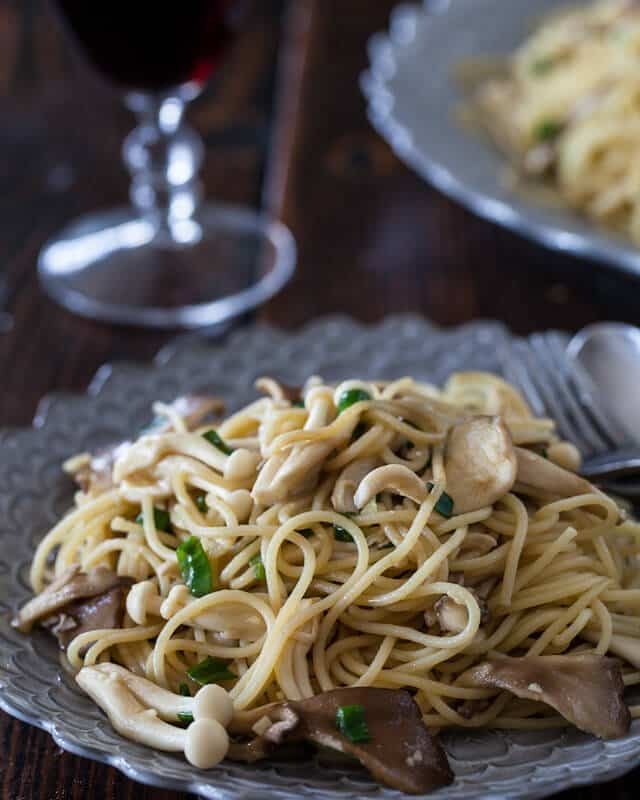 garlic noodles with miso butter All of my favorite ingredients. Garlic, of course, being my favorite ‘vegetable’.